The wonderful stories in this book are based on African American folktales told in the South during the Plantation Era. In the 1880s, Martha Young, a journalist, collected these stories and created many of her own, publishing them in newspapers and then in several books of folktales. Like the popular Bruh/Brer Rabbit stories, these tales are among the most lively and entertaining in all of American folklore. Born out of terrible hardship, they stand as a testament to the indomitable human spirit. 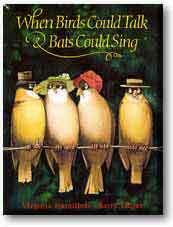 Way far back, when birds could talk and bats could sing, feathered folks just naturally fussed and squabbled among themselves. They were full of pride and foolishness, same as human folks are now—and they were just as full of fun and cleverness. Come along as Newbery Medalist Virginia Hamilton and National Book Award winner Barry Moser take a leisurely stroll back in time to the fields, ponds, and moonlit nights of a long-ago place where shade trees grow tall, and every storyteller’s magic begins by the fence corner.